Congress is scheduled to host what insiders described as the first-ever forum in favor of boycotting Israel, according to congressional sources and an invitation for the event being circulated by an anti-Israel organization. The briefing is scheduled to take place Friday on Capitol Hill and will feature several speakers known for their criticism of Israel and support for the Boycott, Divestment, and Sanctions movement, or BDS, which has been cited by Jewish organizations as an anti-Semitic movement. The event is being sponsored by the U.S. Campaign to End the Israeli Occupation, a pro-BDS organization that recently came under fire when it hosted a Democratic member of Congress who referred to Israeli settlers as "termites." Senior congressional sources with knowledge of the event told the Washington Free Beacon that the Capitol Hill office in charge of reserving the event room would not disclose the name of the lawmaker sponsoring the event. The event is being billed by BDS supporters as the "First Pro-BDS Capitol Hill Briefing" in history, according to an invitation to the event obtained by the Free Beacon. "This briefing will offer Capitol Hill its first opportunity to hear directly from Americans who support BDS and organize BDS campaigns," the invitation states. The pro-BDS hearing is being held as Congress considers several pieces of legislation aimed at defunding the BDS movement and isolating its supporters in the United States. One senior congressional aide familiar with the forum and its supporters told the Free Beacon that the member or members of Congress who sponsored the event should publicly admit it. "The member of Congress who sponsored this offensive event should step forward and claim credit," the source said. "Who is responsible for using taxpayer dollars to fund such virulently anti-Semitic propaganda? Maybe they should host a briefing on how Hamas spends $40 million annually on building tunnels to carry out terrorist attacks on innocent Israelis." A second congressional source told the Free Beacon that insiders are working to discern which member of Congress scheduled the briefing. This person, the source said, should be forced to identify him or herself. "We’re either going to find out that this anti-Israel organization duped an unwitting member of Congress into reserving a room and sponsoring their hateful event, or worse, an elected official is quietly supporting and promoting the BDS movement against Israel while seeking to hide their true efforts from the public," the second congressional source said. Event organizers with the U.S. Campaign to End the Israeli Occupation said that the briefing is meant to educate lawmakers on how the BDS movement goes about boycotting Israel and Jewish-made products. 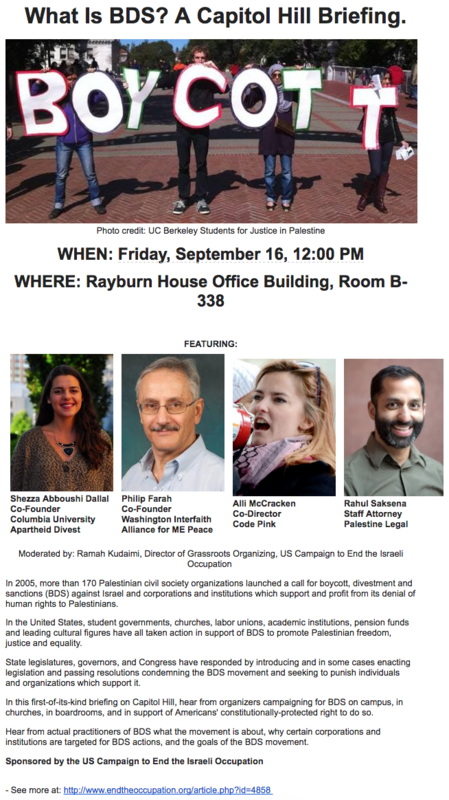 "In this first-of-its-kind briefing on Capitol Hill, hear from organizers campaigning for BDS on campus, in churches, in boardrooms, and in support of Americans’ constitutionally-protected right to do so," the invitation to the event states. "Hear from actual practitioners of BDS what the movement is about, why certain corporations and institutions are targeted for BDS actions, and the goals of the BDS movement." Members of Congress from both parties largely have rejected the BDS movement due to its anti-Israel undertones and rhetoric. The Anti-Defamation League, which fights against anti-Semitism, has described the event sponsor, the U.S. Campaign to End the Israeli Occupation, as "a coalition of anti-Israel groups that promotes divestment from Israeli companies, organizes anti-Israel events, and lobbies the U.S."
Many in Congress are already backing several pieces of legislation that would further isolate the BDS movement, according to insiders. "This briefing is further proof that the BDS movement is losing steam and growing desperate," said the first congressional aide quoted above. 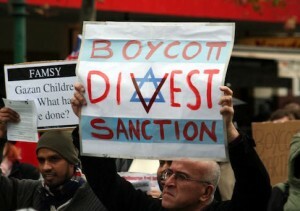 "There is overwhelming support for Israel and disdain for this hateful boycott movement on Capitol Hill. Last year alone Congress unanimously enacted strong anti-BDS legislation."